In October 2014, historian John Taylor announced that he would be creating a documentary film about the history of Victoria Hall (see links below). He hoped to get a grant from the Canada Council for the Arts but it seemed they did not think a documentary film was art so his request was denied. But now, he is planning a book and a 15 minute documentary and wants to use his own money plus raise $25,000 from donors. John currently lives in Vancouver and works in the film Industry but he previously lived in Cobourg and was Executive Director of the Society for the Restoration of Victoria Hall from 1971 to 1975. At the Council’s Committee of the Whole meeting on Monday, he talked about the project and how the history of Victoria Hall was inextricably intertwined with that of the Cobourg Peterborough Railway. John did not ask for financial support from the Town but did promote the project and presumably wanted permission to film inside the building. The Grand Gamble: Competing with Toronto, the Town Fathers of Cobourg rolled the dice in 1853. They would build a grand Town Hall – ‘not just for present but for future purposes’ – and they would build a railroad to Peterborough. The Railroad would go straight across Rice Lake, on the world’s longest bridge. It seemed like a good idea. He showed a 5 minute clip that has already been made for the film. it is a re-enactment of a Council meeting where the architect Kivas Tully was engaged to build Victoria Hall. It looked professional! I first saw Victoria Hall when I was 33. I am now 80 and have been unable to let go of this story. For four years I served as Executive Director of the Society for the Restoration of Victoria Hall, and I have always had a guilty feeling – that I must tell the story of how that building came to be. 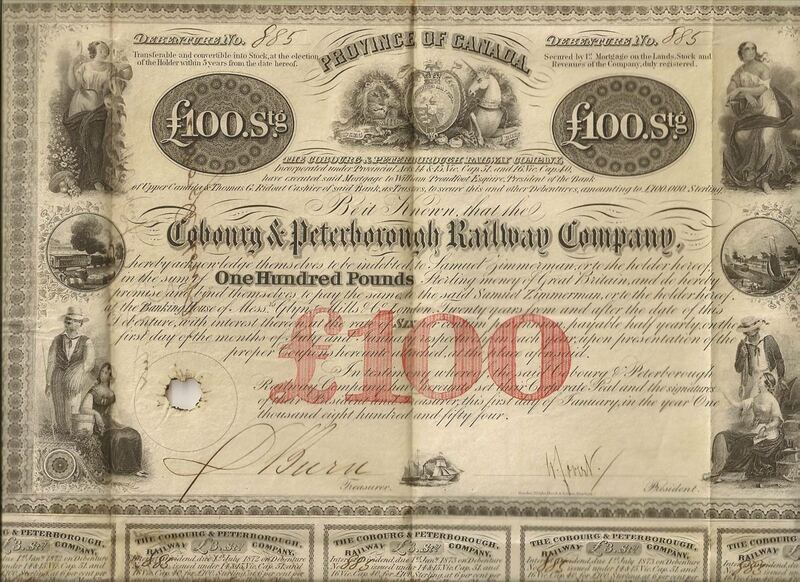 The book that will be produced at the same time will tell the story of Cobourg from 1798 to the present time and donors of $100 or more will receive a copy of it plus a reproduction of an original £100 bond issued to finance the railway (link to image below). Fundraising and INDIEGOGO are in preliminary stages and John gave no timetable for his project. If completed it would be a great asset for the Town and help make Victoria Hall more well-known. Note that the stories of Victoria Hall and the Cobourg Peterborough Railway have been told by others – see the links below to the Cobourg History site. Would that be Kivas Tully, John? Yes – I will correct the misspelling.